The chapter concerns the implementation of novel and advanced HCI (human-computer interaction) methods in the design of educational systems aimed at people with disabilities. E-learning applications can significantly improve the quality of life for handicapped students by increasing their self-reliance and adjusting the learning time frame. The structure and methods used to design the interaction applied in this kind of educational system varies significantly depending on the type of the user's disability. There are examples of the interaction developed with the needs of disabled students in mind discussed in the chapter. The main advantages of different solutions were identified and examined. The authors also try to recognize possible threats and suggest some solutions to avoid them. The majority of contemporary organizations look for new methods of development focusing on cost reduction. The globalization of economy and development of telecommunication technologies increase the efficiency of communication, at the same time reducing its cost. There are more and more areas of life that demanded direct involvement until recently and now have become remotely accessible, enabling the users to break the distance and time barriers. These factors also bring about the development of new methods of education defined as e-learning (Debande, O., Ottersten, E.K. 2004.). From entrepreneur’s point of view, e-learning is one of outsourcing varieties, specifically developed by more and more businesses of IT, telecommunication, finance or training sectors. In some of them this kind of education comprises several dozen per cent of all personnel training courses (Żukowska, 2004). E-learning means remote education with the use of the Internet, multimedia or even virtual reality. 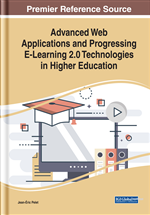 With the help of e-learning the student may acquire information, develop knowledge, check progress in learning and communicate with other participants of the process of education – without the necessity to travel from place to place (Costagliola, et al. 2008). This remote mode of learning also enables the selection of the most suitable path of education and then to follow it in convenient time and pace (Sandars, Langlois, 2005). The fundamental advantages of e-learning are particularly important for people with mobility issues, physically handicapped, requiring permanent medical care or forced to undergo regular medical procedures, for example as part of permanent dialysis therapy, complex oncological therapies or complex rehabilitation after various surgical operations (Baumann-Birkbeck, Karaksha, 2015; Cimmaruta, et al., 2017; Patel, et al., 2018). Online Support: Real-time conversation with the teacher via e-mail messages, chat systems, discussion groups providing at the same time with opportunity to gain exact accurate information from reliable sources in a relatively short time (Sadikin, Purwanto, 2018). It should be mentioned in this point that there is an immense technological chaos in the literature related to this subject. The term pupil is often identified with a student, trainee, educational process participant, similarly, the term ‘teacher’ is identified with lecturer, coach or training instructor. The same phenomenon occurs with the term ‘training’ identified lecture, workshop, lesson, development stage. Therefore, for the purposes of this paper, pairs of terms have been introduced: learner-student, teacher-lecturer, lecture-training.